After reading the first book in this series the book stayed on my mind and I am glad I could quickly jump back into this series with the second book. I am not sure what it is with this series, it isn’t a series that wows me, but it is a lot of fun and enjoyable and I keep having the urge to get my hands on the next book soon and actually read it. So there’s that. 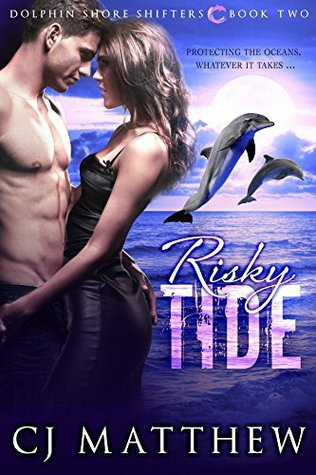 Risky Tide follows a different couple than the first book and stand pretty much apart from that story, but there are also some connections. A few side characters that are in both books and a few small overarching plot lines, although those connections where one of my favourite parts. Each book has their own story and romance, but some sub-plots keep advancing in the background and it’s really well done. Mostly the plot line about shifters being aggressive and the doctor’s theory and the villain, both advance slowly, but they are very interesting. Risky Tide focusses on Katie and peal who are both part of an exchange team, it was fun to learn more about exchange teams do as that stayed a bit vague in the first book. Basically they go to places where dolphins are kept in secret and exchange them out with other dolphins, how no one ever notices they have different dolphins the next day I am not sure, but it made for some interesting scenes. Beside that the focus turns on some illegal waste dumping, which added some suspense to the plot. The plot kept my interest, although there were some scenes towards the end that felt a bit rushed. It also felt that some scene could use a bit elaboration as some scene got a bit confusing do the rushed-ness, then the ending get’s wrapped up a bit too fast and there are some things that are a tad unbelievable or other which seem a bit too easy. I didn’t connect as much with these characters than the couple in the previous book, but I still liked Peal and Katie and grew quite fond of the rest of their team as well. Peal is the leader of the team and while you might expect some drama to arrive from that and how Katie is his subordinate there isn’t much of that and it’s resolved pretty quickly. there’s no big conflict or drama in the romance, which I liked, although I didn’t really feel the passions between these two. They made for a great couple. I also liked how the author mixed in some mental illness in this book and I liked how it was handled, although when Katie finally told about the episode that left her so scared it just felt a bit off. Like it didn’t have the emotional impact it could have, I would’ve preferred a prologue with it, so it would have more emotional impact. And I wasn’t a fan of the focus on getting cured as soon as possible as from what I know it’s more a slow long term process. I did like how even though she was scared she did her best to contribute to the team, although she does crew up a few times. I liked the scene at the end. Beside Katie and peal their point of view we also see the point of two different villains. I am not sure what to think of this. On the one hand it was interesting to see what happened with them, on the other hand it felt a bit overdone with two villains and one of them only played a small part in the overall plot and didn’t really impact it a lot compared to how much page time he got. The other guy was interesting as that’s a continuation of the plot in book 1, but I did feel like it ruined the suspense a bit to see most scenes from both point of views. There was a nice suspense scene towards the end of the book that I liked. Just like in the first book there’s very little focus on the world building. It all stays a bit vague, although in this book we do learn more about the exchange team and how the shifters live, so I liked learning more about their organization that way. There also is one shifting scene in this book and a bit more attention to the topic of shifting, but it just felt like I would like more, see the world come alive more and see how the dolphins live in the water and how they prepare for the land. So it still felt like there’s not enough world building and the focus definitely seems to be on how they live on land and less on the dolphin part. To conclude: while this book didn’t wow me it did keep my attention and it’s just a lot of fun. This series does keep me interested even though I have my issues with each book as well. The story was interesting and we see a few plot lines continuing from the previous books, while most focus is on a new plot line with the exchange team and some waste disposal. It did keep my attention, although some parts felt a bit rushed and some things didn’t fully line up or could use some elaboration. There’s a bit of suspense and we get the point of view of two villains, which I felt was a bit too much. Peal and Katie made for a nice couple, although I didn’t really feel their passion. The characters were okay and we got enough of a feel for them to make me like them, but not enough to really get to know them. The world building is still limited, although we do learn some new things in this book and there’s one shifter scene. I will be continuing this series as it’s fun and enjoyable even though so far the books stay in the okay category and don’t wow me yet. Do you have any series like this that don’t wow you, but do keep you hooked? What makes you keep reading them? I haven’t read a dolphin shifter series before so I will definitely need some solid world building! So even with the good romance, I won’t be as satisfied reading this. I mean Dolphins! You gotta tell me how that whole thing works! The concept is so cool, I mean dolphin shifters! It’s a shame there isn’t as much attention to the world building as I would like, but it’s still a fun series. I really wish, especially in paranormal books, that the author would focus a bit more on world-building. Although this is still a series that I want to check out. For me, I’m really hooked on Molly Harper’s Half-Moon Hollow series, Jennifer Ashley’s Shifters Unbound, and Jessica Sims Midnight Liaisons series. There is so much room for more elaboration on the dolphin shifter process, more world building would’ve bumped this up to a 4 star for me, but even without it, it’s still a great series that keeps my attention. Keionda @Keionda Hearts Books recently posted…☆☆TAKE TIME FOR YOURSELF. This series is entertaining enough to keep continuing, even though it doesn’t wow me, which is good. Often 3 stars books either fall into the disapointing category or in the I will continue this series category, so this series is more on the high end of a 3 star rating. It’s just a shame there are areas that could do better in my opinion. I’m glad Matthew has given you a story that keeps you invested even if it isn’t wow-ing you, Lola. I’m really intrigued by the dolphin-shifters. I admit I was hoping for more world building so I’m sad it wasn’t there. Are you planning to read #3? Yes I am definitely planning on reading book 3, I wa shoping to get a review copy of that too, but haven’t heard back from the author, so I’ll probably buy it eventually when I am in the mood for it. The dolphin shifters idea is so intriguing, that I am a bti disapointed there isn’t more world building. But the series is good nough to keep me entertained. The House of Night series was that way for me too, I really enjoyed the first few books then it went into okay territory and at some point I stopped the series, but not sure why. I think the dolphin shifter idea is fun. Maybe the next couple will be easier to connect with. I am looking forward to the next couple as the main character female there will be the doctor, we already heard about in this book and the previous one, so that should be interesting. Comfortable sounds like a good reason, you know what you get and what to expect and it’s enjoyable even though it doens’t wow you. Sometimes it still pays off to continue those 3 star series. The only other time I’ve encountered dolphin shifters is in the Kate Daniels series, so I keep picturing those. lol. This certainly sounds interesting, but yeah, I know what you mean. I’ve had a couple series I wasn’t wow’d by, but still had that need to read them. The concept of dolphin shifters is really cool and original, although it would be even better with some mroe world building. I think this is the first series I’ve read with dolphin shifters. Even though this series doesn’t wow me, it does make me want to keep continuing the series.